Video Customisation Note: Please Read more information to know the process. Surprise your dear one with video presences by gifting this cute hamper consists : Fancy Georgette Saree SEY-56 ( Kanchan-2774)+ Cute 25 Red Roses flower bunch with fillers wrapped in a decorative paper +Video CD Note: Please Read more information to know the process. Surprise your dear one with video presences by gifting this cute hamper consists : Sapphire Hazelnuts -code004 Hazelnuts Covered with Milk Choco Net weight: 160 gms +Heart Shape Pillow - PST -738-2 Size : 32CM*23 CM +Video CD Note: Please Read more information to know the process. Surprise your dear one with video presences by gifting this cute hamper consists : Rasasi - Romance men perfume-004 + Heart - PST-926(SMALL) -24 Size: 16cm * 11cm + Dairy Milk Silk chocolates - 3 bars + Dairy Milk Roast Almonds chocolates - 3 bars + 5 Star chocolates - 5 bars + Pink color round shape basket +Video CD Note: Please Read more information to know the process. 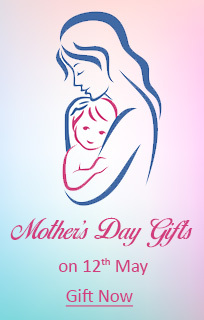 Surprise your dear one with video presences by gifting this cute hamper consists : Multicolor Pattu Parikini-Ooni Set with Mustard Border SIR-23 +Beautiful 25 red roses flower bunch with red color decorative paper wrapping along with bow +Video CD Note: Please Read more information to know the process. 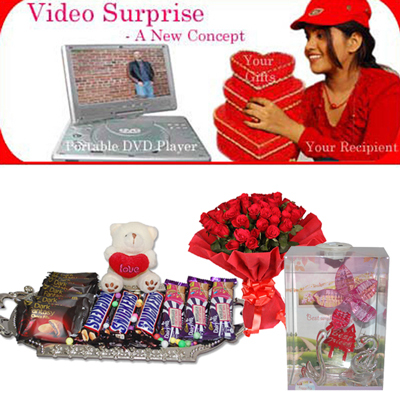 Surprise your dear one with video presences by gifting this cute hamper consists : RISVITA HEART DIAMOND PENDANT - TPD10212629 +Beautiful Heart shape 50 Red roses flower arrangement +Video CD Note: Please Read more information to know the process. 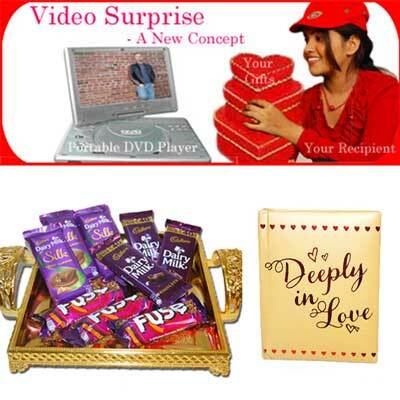 Surprise your dear one with video presences by gifting this cute hamper consists : Perk chocolates - 5 bars + Go fresh chocolates - 5 bars + 5 star chocolates - 5 bars + ONLY HEART Chocolates -3 pcs pack Wafer filling with Chocolate Cream Net weight: 37.5 gms + Gold color designer Tray +Heart shape Pillow - Size: 25CM *18 CM +Video CD Note: Please Read more information to know the process. Surprise your dear one with video presences by gifting this cute hamper consists : Cadburys Dairy milk silk Roast Almond chocolates - 3 bars + Cadburys Fuse chocolates - 3 bars + Dairy milk chocolates - 3 bars + Gold color Designer Tray + Deeply in Love quotation miniature book + Video CD Note: Please Read more information to know the process. 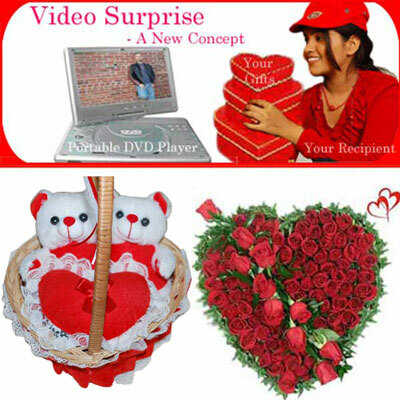 Surprise your dear one with video presences by gifting this cute hamper consists : Couple Teddy - KT 099 +Beautiful Heart shape 50 Red roses flower arrangement +Video CD Note: Please Read more information to know the process. 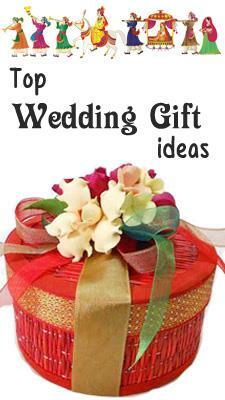 Surprise your dear one with video presences by gifting this cute hamper consists of Beautiful Flower Bunch with 25 Red Roses with decorative paper wrapped.+ Delicious heart shape strawberry cake -1kg + Video CD Note: Please Read more information to know the process. Surprise your dear one with video presences by gifting this cute hamper consists of Valentine Couple - POP Doll - 22-294 03 Size :16cm *15cm +Heart Shape Sapphire Fruit & Nut Chocolate Box Weight: 160 gms +INFINITY FOUR HOMME 100 ML-006 - Perfume for Men + Video CD Note: Please Read more information to know the process. Surprise your dear one with video presences by gifting this cute hamper consists of Pink Teddy - BST-3901-004 Height:28cm+ Cadburys Dairy Milk Silk Bubbly chocolates - 3bars + Mars chocolates - 3 bars + 5 star chocolates - 3 bars + Thread Basket + Video CD Note: Please Read more information to know the process. 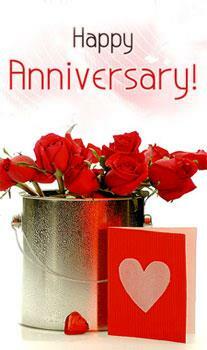 Surprise your dear one with video presences by gifting this cute hamper consists of Rasasi - Romance women perfume-003 + Cherir Chocolates 5 pcs + Dairy Milk Silk Roast Almond chocolates -3 bars + Five star chocolates -3 bars + Thread Basket + Video CD Note: Please Read more information to know the process. 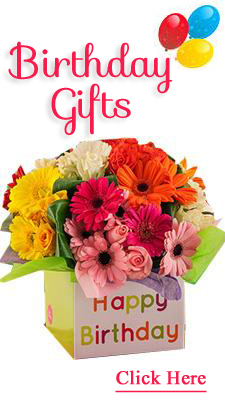 Surprise your dear one with video presences by gifting this cute hamper consists of Titan Ladies Watch 2455YM01 + Beautiful Flower Bunch with 25 Red Roses with decorative paper wrapped + Video CD Note: Please Read more information to know the process. Surprise your dear one with video presences by gifting this cute hamper consists of Valentine Pair Marble Finish - 22-291 02 Size :28cm + Snickers chocolates - 3bars + Cadburys dairy milk crackles chocolates - 3bars + perk chocolates - 5 bars + Silver coated fancy basket + small teddy + Video CD Note: Please Read more information to know the process. 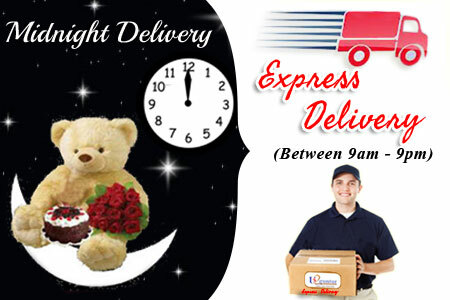 Surprise your dear one with video presences by gifting this cute hamper Cadburys Dairy milk Marvellous creations chocolates each 75 gms- 3 bars + Dark Fantasy with choco fills Biscuits pack + Snicker chocolates - 3 bars+ Small teddy bear + tray+ Crystal Best Friend stand with Lighting - 1219-002 + Video CD + 25 Red Roses Bunch Note: Please Read more information to know the process. 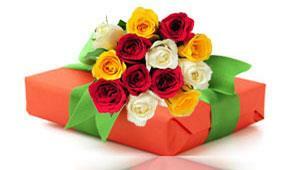 Surprise your dear one with video presences by gifting this cute hamper consists of Beautiful flower arrangement of 20 red and yellow roses + Video CD Note: Please Read more information to know the process. Surprise your dear one with video presences by gifting this cute hamper consists of 1kg Heart shape cake + Beautiful 20 red roses flower arrangement + Video CD Note: Please Read more information to know the process. Surprise your dear one with video presences by gifting this cute hamper consists of 25 red roses flower basket + 3pcs of Cadburys temptation chocolates+ Video CD. Note: Please Read more information to know the process.